The Collection Creative Offices — Isaman design, Inc. Located on the 9th floor of an historic Downtown Los Angeles office building, The Collection Creative Offices is a tenant improvement and update to an existing underutilized space. With a recent influx of creatives and professionals into the heart of Downtown Los Angeles, the design aims to provide a bright, professional and flexible work space for multiple tenants on the same floor. A large lounge and shared kitchen space feature built in booths and a custom fabricated work table to promote interaction and collaboration between tenants. 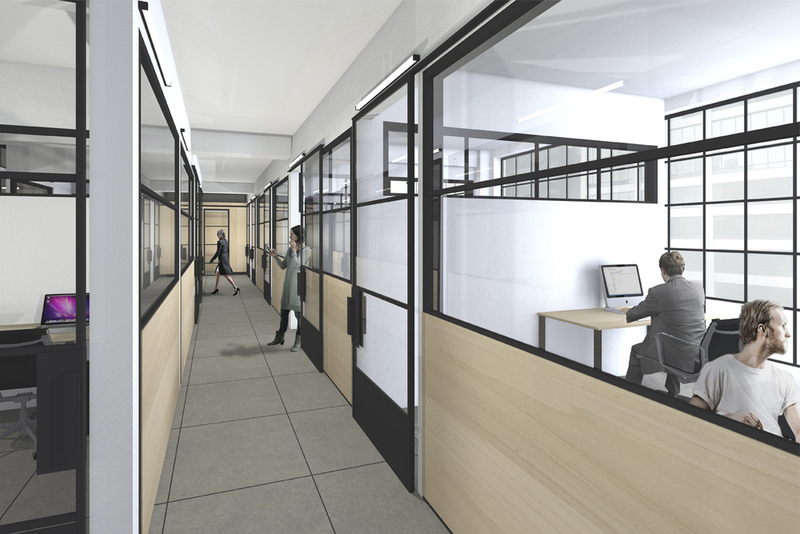 The design takes full advantage of the over-sized, North facing factory windows through the use of custom steel framed glass and maple partition which provide privacy between offices, without diminishing light quality. Flexibility and adaptability of all of the spaces was imperative to the design. The offices range in size from single tenant to shared 14 desk co-working rooms. Three conference rooms can be used individually or combined by opening the glass stacking slider doors to create one large conference room or event space. The Collection Creative Offices are meant to provide an elevated, professional alternative to other office spaces available in the Downtown districts.